The EK-F3x-CAP evaluation kit offers a simple and cost-effective way to test sensors of the SFM3xxx platform. 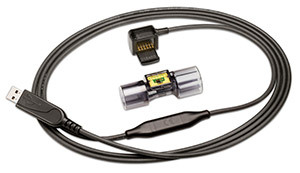 The set consists of a USB cable which connects to the corresponding flow meters. Using the software available online, the sensors can be quickly tested under real-life conditions. There is no need to program a microprocessor as the evaluation kit can be directly connected to a PC. The software shows the measurement data directly on the user’s computer screen. Furthermore, the data can be exported into an Excel spreadsheet which can then easily be saved and further processed. The Sensirion SFM3xxx platform includes sensors for inspiratory, expiratory and proximal flow measurement, as well as gas mixing in ventilation and anesthesia applications. With the platform, the sensor manufacturer offers its customers the right sensor for all flow measurements and underscores its worldwide expertise in the field of medical ventilation. The reusable “AW” versions are autoclavable and washable, and therefore well-suited for expiratory flow measurement. The disposable “D” versions are a safe and cost-effective alternative to reprocessing. Like all sensors from Sensirion, the outstanding performance of the SFM3xxx sensors is based on the patented CMOSens® Technology. This enables integration of the sensor and evaluation circuit on a single CMOS silicon chip. The result is an ultra-precision system that offers long-term stability for sophisticated and cost-sensitive applications. The technology is also highly resistant to environmental effects, which is why Sensirion’s flow sensors are perfect for use as sterilizable sensors. Visit Sensirion between February 5 and 7, 2019 in Anaheim at the MD&M West fair, stand 1556, and learn more about the new evaluation kit EK-F3x-CAP. For more information, visit www.sensirion.com/gasflow or www.sensirion.com/medical.